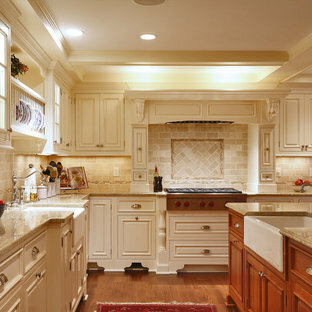 Large classic u-shaped kitchen/diner in New York with medium hardwood flooring, a belfast sink, raised-panel cabinets, beige cabinets, granite worktops, beige splashback, stainless steel appliances, an island and travertine splashback. 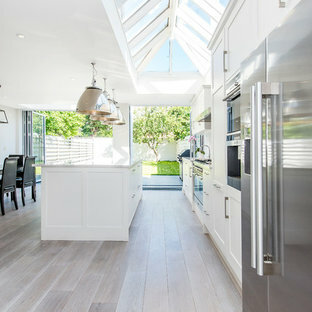 This is an example of a traditional l-shaped open plan kitchen in New York with a submerged sink, shaker cabinets, white cabinets, granite worktops, white splashback, metro tiled splashback, stainless steel appliances, ceramic flooring and an island. 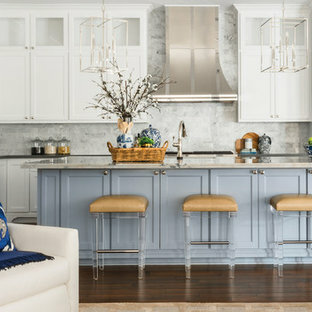 Medium sized classic single-wall open plan kitchen in Los Angeles with a belfast sink, raised-panel cabinets, white cabinets, stainless steel appliances, blue splashback, engineered stone countertops, glass tiled splashback, medium hardwood flooring, an island and blue worktops. 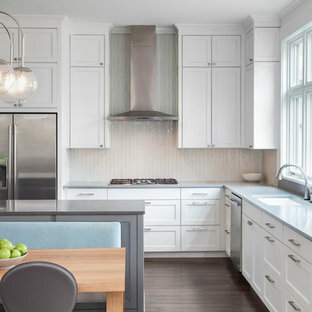 By John Donkin Architect Inc.
Design ideas for a large contemporary single-wall kitchen/diner in Ottawa with a double-bowl sink, flat-panel cabinets, white cabinets, brown splashback, concrete flooring, wood worktops, glass sheet splashback, stainless steel appliances and an island. 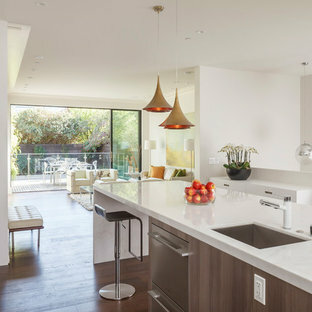 Photo of a large contemporary u-shaped open plan kitchen in San Francisco with a submerged sink, flat-panel cabinets, stainless steel appliances, an island, dark hardwood flooring, white cabinets, engineered stone countertops, white splashback, stone slab splashback and brown floors. 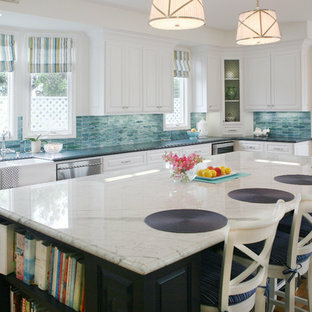 Inspiration for a medium sized classic single-wall open plan kitchen in Los Angeles with a belfast sink, raised-panel cabinets, white cabinets, blue splashback, stainless steel appliances, engineered stone countertops, glass tiled splashback, medium hardwood flooring, an island and grey worktops. This existing client reached out to MMI Design for help shortly after the flood waters of Harvey subsided. Her home was ravaged by 5 feet of water throughout the first floor. What had been this client's long-term dream renovation became a reality, turning the nightmare of Harvey's wrath into one of the loveliest homes designed to date by MMI. We led the team to transform this home into a showplace. Our work included a complete redesign of her kitchen and family room, master bathroom, two powders, butler's pantry, and a large living room. MMI designed all millwork and cabinetry, adjusted the floor plans in various rooms, and assisted the client with all material specifications and furnishings selections. Returning these clients to their beautiful '"new" home is one of MMI's proudest moments! 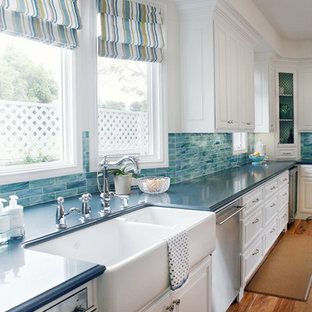 Design ideas for a medium sized classic l-shaped enclosed kitchen in New York with a submerged sink, recessed-panel cabinets, white cabinets, white splashback, mosaic tiled splashback, stainless steel appliances, an island, marble worktops and brown floors. Design ideas for a classic galley kitchen/diner in London with white cabinets, shaker cabinets, stainless steel appliances, light hardwood flooring and an island. Large coastal galley open plan kitchen in Miami with a submerged sink, marble worktops, multi-coloured splashback, stainless steel appliances, an island, light hardwood flooring, recessed-panel cabinets, white cabinets and mosaic tiled splashback. This spectacular kitchen reflects a great mix of wood and painted finishes. Appliances include a built-in coffeemaker and steam oven. Paneled Subzero 27" refrigerator/freezer units mimic the look of furniture. 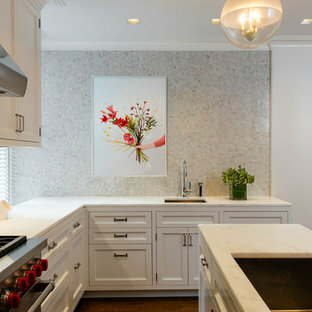 Accents of polished stainless on the cabinetry complete the sophisticated look. 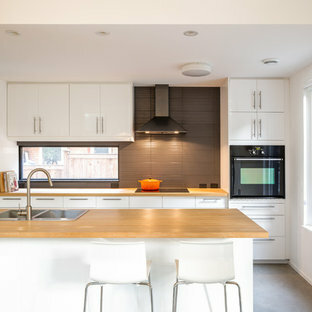 Photo of a contemporary galley open plan kitchen in Ottawa with flat-panel cabinets and white cabinets. 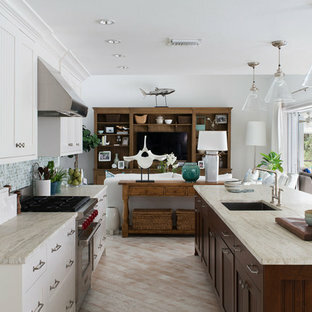 Rufty Homes was recognized by the National Association of Home Builders with its “Room of the Year” award, as well as a platinum award for “Interior Design: Kitchen”, in the 2012 Best in American Living Awards (BALA). For the past 6 years, Rufty Homes has been named top custom home builder by Triangle Business Journal. This is an example of a medium sized rural single-wall kitchen/diner in Manchester with a single-bowl sink, marble worktops, white cabinets, stainless steel appliances, raised-panel cabinets and dark hardwood flooring.